Before I tell you how utterly delicious this recipe is and how you should make it right away, I give you permission encouragement to serve this either for dessert or breakfast. Or both. On the same day. Bread Pudding with Warm Vanilla Sauce was something that for some reason I simply had to have on a daily basis during our cruise in December. Royal Caribbean offered it daily aboard Oasis of the Seas (best ship ever), and I got my money’s worth between that and my unlimited fountain drink cup. Anyhow, all this to say that I have been meaning to replicate it at home ever since. This version is even better than the original because you can enjoy the slightly crunchy top that provides a texture that can be difficult to maintain when feeding masses of hungry passengers aboard a giant ship. 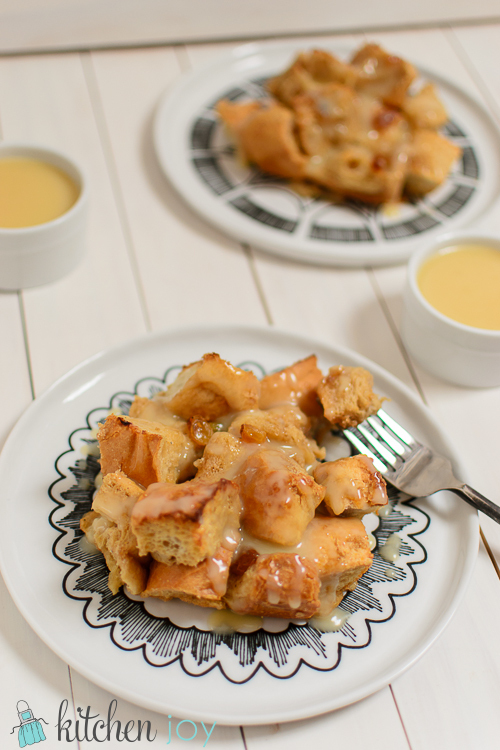 Bread pudding is extremely easy to make. It’s basically French toast in a casserole dish. 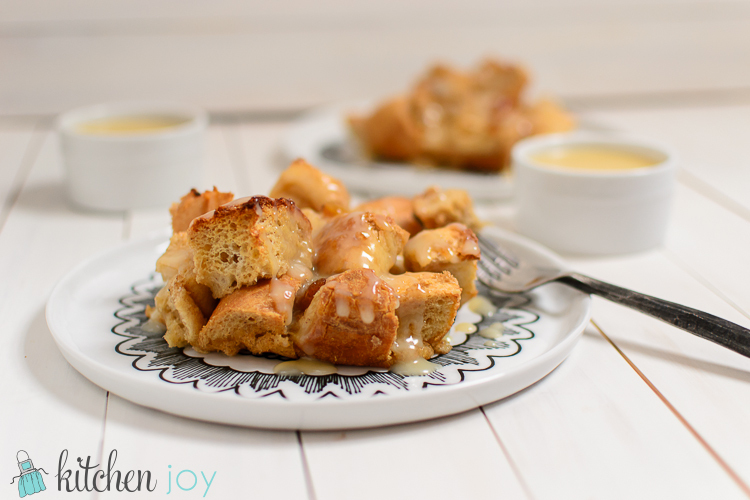 What really puts this Bread Pudding over the top is the Warm Vanilla Sauce. Speechless. Sweet, creamy, and the perfect complement to the subtle spices in the custard base. It would also be amazing on apple pie, apple crisp, ice cream, waffles, or your fingers. I’m not here to judge. 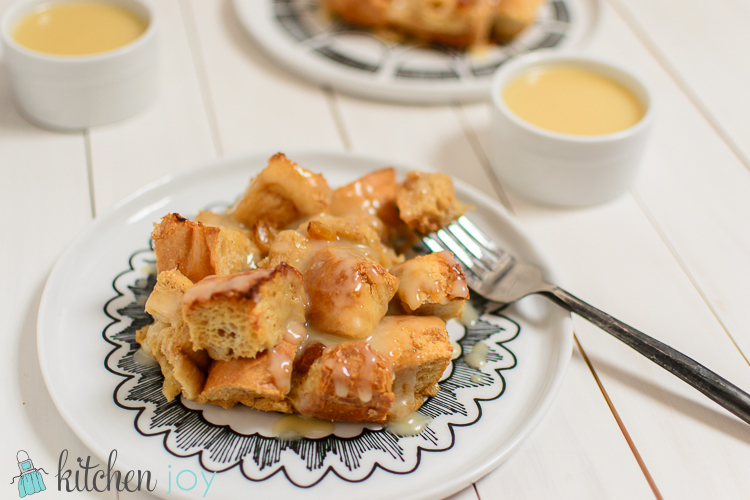 The sauce itself is similar to the Vanilla Crème Anglaise in my Apple Charlotte recipe, but doesn’t require fussing with egg yolks and whatnot, making this recipe super simple to throw together on short notice. You could also use the Caramel-Banana Sauce that I make with my Banana Poppy Seed Pancake recipe. It’s amazing, and would be fabulous on just about anything. 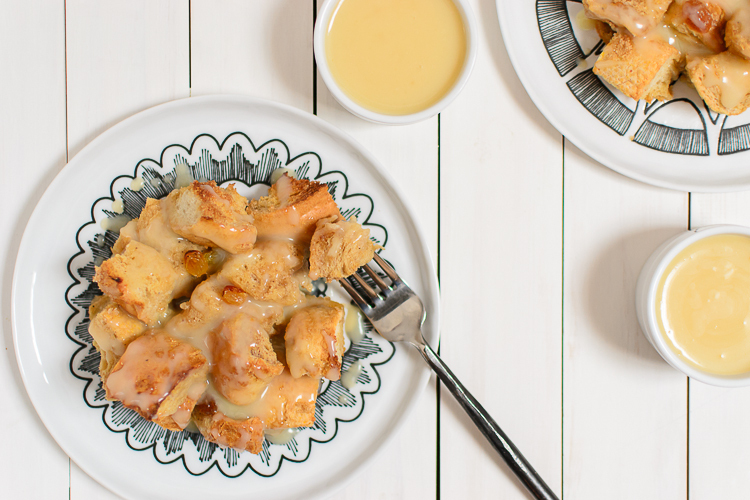 This bread pudding recipe is exactly the sort of thing that I love making on cold, wintery Sunday nights while watching Downton Abbey. It’s so comforting. Preheat oven to 350 degrees F. Butter a 9x13-inch baking dish. Toss bread cubes and plumped raisins together in a large bowl. In a medium saucepan, whisk together the milk, sugar, cinnamon, nutmeg, and cardamom. Add butter and heat over medium-low heat until butter has melted and milk is warm, but not boiling. Remove from heat and whisk in vanilla and beaten eggs. Pour egg mixture into the bowl of bread cubes and raisins. Gently stir the bread until all cubes have been coated with the egg mixture. Let sit for 5 minutes. Transfer mixture to prepared baking dish. Sprinkle brown sugar over the top. Bake uncovered for 35-40 minutes, or until custard is set in the center and the top is lightly golden. Serve immediately with vanilla sauce. In a medium saucepan, whisk together the sugar, flour, and heavy cream. Add butter and heat until boiling, whisking frequently. Let simmer for a few minutes until sauce has thickened to your desired consistency. Remove from heat and stir in vanilla. Keep warm until ready to serve.